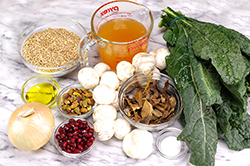 Featuring kale, a primo leafy green, this dish takes on a deep savory character with the addition of earthy mushrooms, nutty-tasting farro, and crunchy pistachios. The dressing features a white balsamic vinaigrette, though you’ll find this dish delicious with or without the dressing. This is one nutritionally dense entrée! 1. 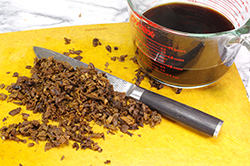 Rehydrate the dried porcini mushrooms by placing in 1-1/2 cups boiling water; let stand for 15 minutes until softened. 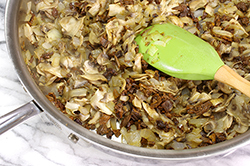 Reserving the liquid (strain if necessary), remove the mushrooms and chop coarsely. 2. 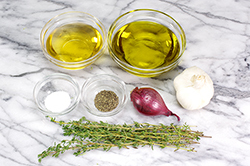 In a large sauté pan with lid, sauté the diced onion in olive oil for 3-4 minutes. 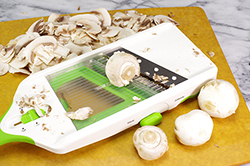 Add the thinly sliced button mushrooms and the chopped porcini mushrooms; continue sautéing until the onions are translucent, and the mushrooms completely wilted. Add the crushed garlic and sauté an additional 30 seconds. 4. Meanwhile, prepare the kale by washing, stemming and tearing the leaves into smaller pieces. 5. 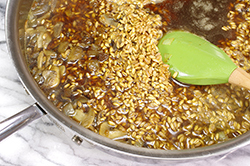 Prepare the dressing by whisking together the vinegar, shallot, garlic, salt, pepper, and thyme leaves. Gradually drizzle in the olive oil while continuing to whisk. Or, place all ingredients in a salad shaker or jar, and shake vigorously. 6. 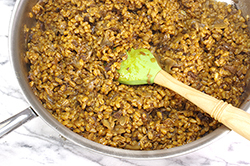 Assemble the dish when the farro is tender by adding the kale to the farro, and stirring to combine. Cover for 5 minutes to allow the heat to partially wilt the kale. 7. 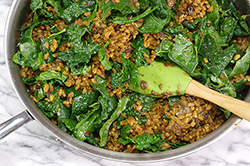 Immediately before serving, toss the farro-kale mixture with half the dressing; serve the remainder of the dressing on the side. 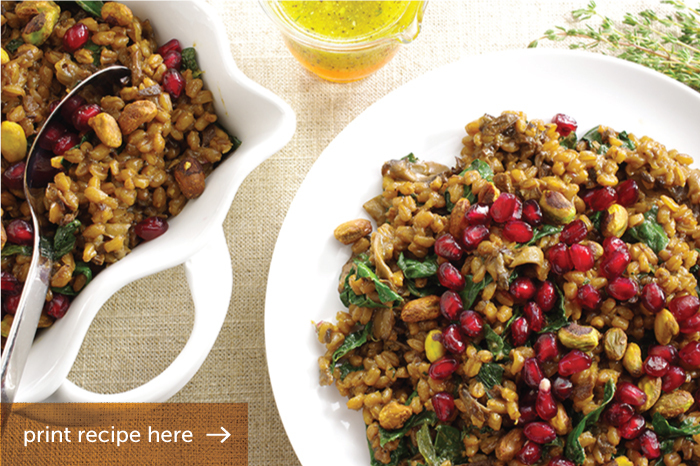 Garnish generously with pistachios and pomegranate arils.